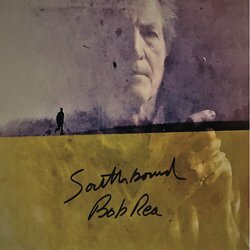 Bob Rea, will be a complete unknown to most, and yet this Nashville-based singer-songwriter arrives with this release, fully formed. He’s actually been making music for 50 years now, even though this is only his third recording, the last album coming out 7 years ago. He’s definitely of the old school, his weathered, gravel tones sounding something like a cross between Johnny Cash, Guy Clark, Steve Earle, and John Prine. But it’s in the area of songwriting that Bob Rea’s skill most clearly abounds. Apparently, Rea had a number of songs dating back several years that had either the word, ‘Southbound,’ the phrase ‘going south’ or a number of train references in them – and these proved the inspiration for much of the material on his new record. The album features all original songs, most of them Rea’s own, but with some co-writes. The title track is first up and what a rollicking, rolling blend of country and folk it proves to be too, perfectly conjuring up the wandering gypsy mid-Western lifestyle, the beautiful female protagonist of the song only hanging around long enough to make people realise what they’ve missed out on, long after she’s moved she on:“She will leave them broken-hearted with a Mona Lisa smile/And every fire she started will be burning for a while.” Sheer poetry. It’s followed by the starker, less melodic, tub-thumping rhythm of ‘Soldier On’ accompanied by mandolin. Particular mention must also go to the songs, ‘Vietnam’ which illustrates the lottery of the draft which led a friend of Rae’s – now “forever gone” – who went to fight in the war, while Rea stayed at home, and ‘The Law’ which features some stellar guitar work. Special praise has to go to the musicians that accompany Bob Rae on this album – Mike Daly on steel guitar and dobro, Steve Daly on guitar and banjo, and Jeremy Holt on mandolin – all of whom make significant contributions. This is an album rich in lyrical content and with songs deserving of a much larger audience than it’s likely to garner. A sound at once familiar and yet truly original.